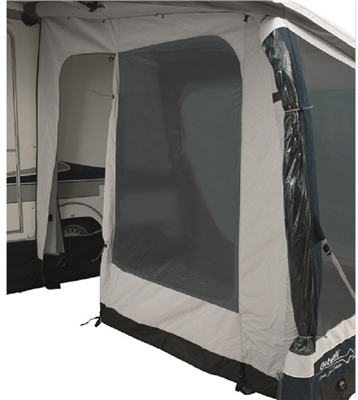 The Nordic Shore Partition Wall fits on either the right or left side of Tide awnings, locking in the warmth and creating separate rooms. Comes with curtains that match the awning. The Partition Wall divides the awning living area into two smaller rooms for more versatile use or to reduce heating needs. There is a large tinted window with a curtain. The wide door gives easy access. Tough, easy to clean PVC mud walls and mud flaps around the base of each awning protect the fabric from staining by rain-driven soil and abrasion from gravel.